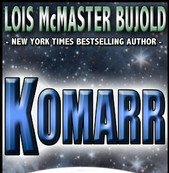 Vorkosigan saga written by Lois McMaster Bujold is series of SF novels and stories (reading order) Shards of Honor, Barrayar, The Warriors Apprentice, Mountains of Mourining, The Vor Game, Cetaganda, Ethan of Athos, Labyrinth, Borders of Infinity, Mirror Dance, Memory, Komarr, Civil Campaign, Winterfair Gifts, Diplomatic Immunity, Cryoburn. Thousands of pages of creative SF, located on several different planets and worlds, so far experiencing good critics, especially by women. What is the reason? Perhaps, because the main character, Miles Vorkosigan is physically disabled, but his intelligence makes up for any physical deficiencies, which often puts him in a position where often the womens are finding themselves. Maybe, due to reason that Miles seeks at least half of the issued books for real love jumping from bed to bed from beauties over hermaphrodites to cloned warrior werewolves... all they do withstand Miles and his charm and energy. Also, Cordelia Naismith Vorkosigan leaves carrier for love and making family, but from time to time is also able to decapitate main bud guys if required. Vorkosigan saga is not full with complicated technological details, but as proper SF, gives large amount of different alien races describing their cultural, economical and political environment. Big space battles, wars, loyalty games and wild story twists can be found in every book, and they are asking for more. If you start to read those books, be prepared to be hooked until the story ends and there are 16 parts to read. anonymous: "Vorkosigan Saga, Shards of Honor (1986), Barrayar (1991), Cordelias Honor (1996), The Warriors Apprentice (1986), Borders of Infinity (1989), Brothers in Arms (1989), The Vor Game (1990), Barrayar (1991) Vorkosigans Game (omnibus: The Vor Game, Borders of Infinity) (1992), Mirror Dance (1994), Cetaganda (1995), Memory (1996), Young Miles (omnibus: The Warriors Apprentice, The Mountains of Mourning, and The Vor Game) (1997), Komarr (1998), A Civil Campaign (1999), Miles, Mystery and Mayhem (omnibus: Cetaganda, Ethan of Athos, and Labyrinth) (2001), Diplomatic Immunity (2002), Miles Errant (omnibus: Borders of Infinity, Brothers in Arms, and Mirror Dance) (2002), Miles, Mutants and Microbes (omnibus: Falling Free, Labyrinth and Diplomatic Immunity) (2007), Miles in Love (omnibus: Komarr, A Civil Campaign and Winterfair Gifts) (2008), Winterfair Gifts (2008), Cryoburn (2010), Captain Vorpatrils Alliance (2012), Ethan of Athos (1986), Falling Free (1988), Dreamweavers Dilemma (1995), Captain Vorpatrils Alliance (2012), The Curse of Chalion (2001), Paladin of Souls (2003), The Hallowed Hunt (2005), Beguilement (2006), Legacy (2007), Passage (2008), Horizon (2009), The Spirit Ring (1993)..."
anonymous: "Vorkosigan Saga and Lois McReallyMaster review, good one."